Stacken has a chatroom at KTH's XMPP server on stacken@chat.kth.se. Here we talk about everything that has with Stacken to do. This is also our primary out-of-band channel i.e. it works even if our server hall is offline. You don't have to be a member in Stacken nor study at KTH to join our channel. Are you a KTH student and don't have a Jabber account? You can create one at KTH's Jabber page. Stacken runs a Matrix server where we have several chat rooms. The room #stacken:stacken.kth.se is public and open for all, you don't have to be a member in Stacken nor study at KTH to join our channel. #stacken:stacken.kth.se is mirrowed with the XMPP room stacken@chat.kth.se. Stacken have a #stackenkth at Freenode. The channel is to well used but it's a easy way to say hi. We mosly use this room for specific events. stacken@stacken.kth.se is a generic list, everything Stacken, talk about problems, fun things to do or just the weather. This list contains both members and non-members. Our club room is open all the days for members. Thursday evenings from 7 PM are our traditional day where we meet in the clubroom and build something, debug a problem or discuss something interesting. Non-members and guests are always welcome, we recommend that you contacts us in advance so we can make sure that someone is there to let you in. A few members like to eat dinner together around 6pm. We usually coordinates our dinner plans on XMPP/Matrix during the afternoon. By tradition we usually eats sushi at Sushi Zen. Here is a list of previous forum used at Stacken. Not used anymore. Mailing lists and TokKOM are used instead. Stackens LysKOM is called TokKOM. This was used for generic conversations. Planet Stacken is an aggregation of the blogs of some of our members. It's not limited to just club-related topics or to any specific set of languages. 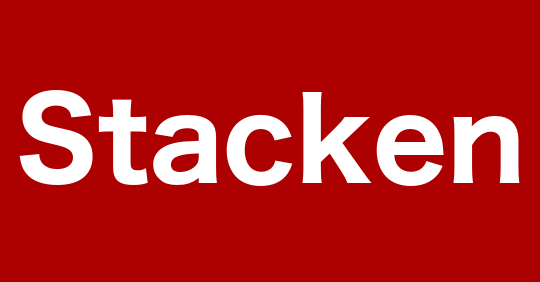 Stacken Blogs is a place where Stacken members can publish their blogs. The software used is NewsBruiser. Syndication on Planet Stacken is optional.